The 2018 Phuket Vegetarian Festival was on from 8 - 18 October 2018. I was away for most of it so did not attend any of the main events. The event in 2017 was different. King Bhumibol's cremation was October 26th 2017, so the country was in a mourning period and the normal festival processions were cancelled. In 2019 the date will be 28 September - 8 October. And I will be there! 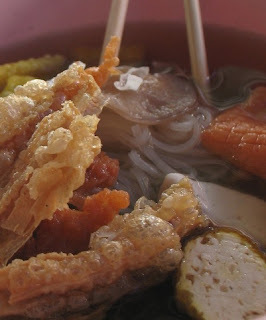 Links below to most, if not all, vegetarian festival blog posts on the Phuket Blog. And there are lots. Because I love this festival! 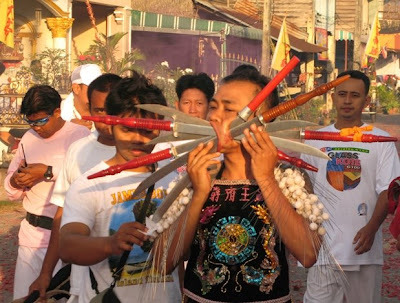 Over the last 7 years on this blog I have written plenty about the Phuket Vegetarian Festival. There are multiple posts detailing different aspects of the festival from 2006 - 2012 with more on the way! The Vegetarian Festival is my favourite event in Phuket. The face-piercing processions, the food, the mystical rituals at the shrines... this is a special time of year. The festival has been a part of Phuket's culture and history since 1825. It's no show, it's not made up for the tourists and not for the faint hearted. This is the real Phuket! This blog post is mainly intended to tie up all the vegetarian festival related posts from the last few years. I never saw a procession until 2006 and didn't have a great camera then. There are better pictures from 2007 and 2008 also some little videos made in 2008. By 2009 I finally had a much better camera (EOS 20D) and got some great photos. There are also posts which are less about the bloody processions and more about some of the Chinese shrines and of course the food. The last few years I have tried to get to at least one shrine early morning (6 - 6:30am) before a procession to see the face piercing take place. Kathu Shrine is only a couple of kilometers from my house. Kathu has a largely Chinese Thai population and was the center of the tin mining industry in the 19th century. Watching the piercing was very interesting to say the least. Must try to get up even earlier one year. I want to see the Ma Song (devotees) becoming entranced in the shrine. The Kathu procession is one of the larger ones and they walk about 5km from Kathu into Phuket town. I followed them into town. Processions are in the early morning starting around 7am to avoid the midday heat. In 2009 I also went to the procession for Jui Tui Shrine, which is in the old town and much more crowded. Kathu is much easier to move around and take photos. 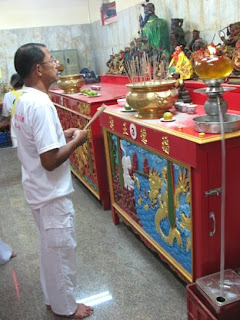 In 2010 I had a manic morning following the Bang Neow Shrine procession, another of the biggest shrines in Phuket Town. I experimented with some videos in 2008, but just using a simple Canon Powershot camera on video mode - not pro quality but some of these little clips give a very good idea of what goes on. Hope to get a good HD video camera sometime in 2011 and want to take more videos. If a picture speaks a thousand words, what value a video? The food is an integral part of the vegetarian festival. Locals who are taking part will only eat specially prepared food which is pretty much vegan, not only vegetarian. 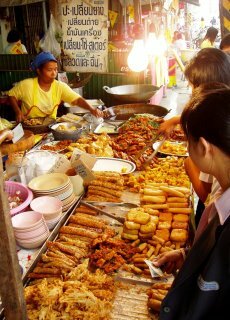 The Thais can do 100 things with tofu and sometimes its hard to believe you are not eating meat. There are "Jae" foodstalls all around the shrines, not so many around the beach areas. Phuket town is the best place to be especially around Jui Tui or Bang Neow shrines. Other shrines on the edge of town like Sam Kong are worth a visit, and maybe I'll see you at Kathu Shrine if you head in that direction. 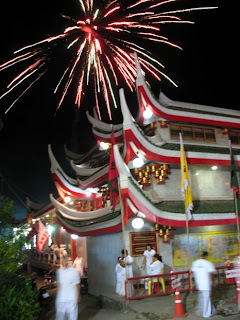 The vegetarian festival is mainly celebrated by the Chinese Thai community, most of whom live in and around Phuket Town, with others further north in the Thalang area, the older parts of Phuket. Not much going on around the beach areas, if you want to see something, head for one of the main shrines. I've blogged some of them, still want to write about Bang Neow which is on the south side of Phuket town. Jui Tui is the largest, and is near the market, easy to get to and the streets in that area are packed with food stalls during the festival. Kathu and Sam Kong shrines are both pretty close to my house, just 2 or 3km, so we go to get food from these areas in the evenings. I try to stick to the diet for the whole 9 days of the festival. It's very good for cleaning out the body. The Phuket vegetarian festival is something very special, and a million miles from the resorts and beaches of Phuket. If anyone wants a unique experience, then October is a good time to come to Phuket! The full schedule for the festival is published each year on this blog (See Here).